While we are often behind the scenes at events supporting as organisers or in a communications capacity, we do try as often as we can to attend as delegates! Most recently we had the pleasure of attending the Institute of Directors Northern Ireland (IoD NI) Women’s Leadership Conference which aims to contribute to the professional development of Northern Ireland’s current and future business leaders while facilitating networking. Centred on the theme of ‘innovation’, the conference featured panel discussions on the language of leadership, emotional intelligence, business evolution as well as an ‘in-conversation’ session with trailblazers across the public and private sector. With discussions facilitated by a razor-sharp host – finance expert and author Susan Hayes Culleton – there was more than one key take-away for guests as we heard from leading local and international business minds including Christine Ourmières-Widener, CEO of Flybe, Rosemary Steen, Director of External Affairs, EirGrid; Alice Charles, Urban Development Leader at the World Economic Forum, Carmel McKinney OBE as well as key note speaker, the writer, broadcaster and award winning entrepreneur, Liz Earle MBE. Moving from ‘team professional’ to ‘commercial leader’: Take the time out to understand the business and board end of your organisation but capitalise on your practical skills and how this can enhance your credibility in the organisation among customers and colleagues. Hone your focus: Understanding your base passion and motivation is essential. Ask yourself, what is the noble cause of your profession? What is your aim and how are you helping people? By answering these questions, you can understand your own and your customer motivations and build your awareness. Navigating negativity: It’s not enough to believe or even know your approach to a particular issue is right. You need to tactfully and carefully communicate your facts and demonstrate your credibility by bringing people with you – a technique those in the communications professional should hopefully be able to harness easily enough! Document the achievement of your team and tell them, by showing the same level of empathy to everyone you isolate no one. See every ‘not yet’ moment as a feedback opportunity – the process of learning can be as useful as the result. On interacting with different audiences: Adapt how you interact with others, don’t expect them to adapt to you. Again, another technique communications professional are good at harnessing for clients and campaigns that can also be applied to our own professional development. Adaptability makes the different between a good and a great leader. Beginning your leadership journey? a)Build a network (and use it to lift you up after the knocks that would inevitability come) b) Be generous (with your time) c) Be open (authentic with your intent) d) Be curious (seek first to understand) e) Get a mentor! One additional stand out piece of advice that really resonated with the audience – and indeed other speakers – came from Christine Ourmières-Widener, CEO of Flybe when she was asked what she’s learnt from past failures. Instead of pointing to a career hiccup or customer crisis, Christine spoke about a turbulent time in her family life that she got through. She finished by advising people to ‘apply best practice from your personal life to your professional life’. 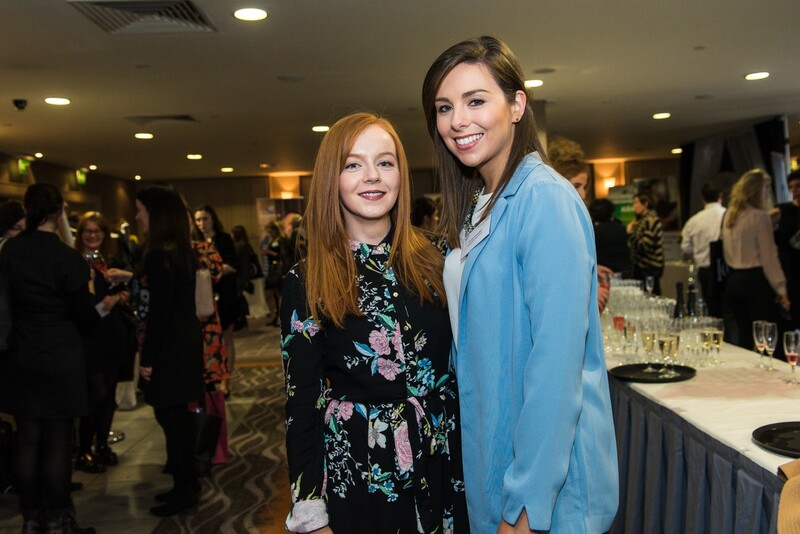 Clare Daly, Senior Communications Manager (Left) is pictured with Emma Campbell, Devenish Nutrition at networking session of 2018 IoDNI Women in Leadership Conference.